Madcap mariachis and aromas of sizzling fajitas attract tourists and locals alike. 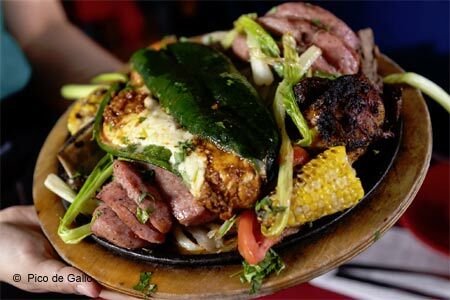 : Located just to the west of popular Market Square and Produce Row, Pico de Gallo bridges the gap between aunt Maude from Moline and savvy locals in tune with traditional Tex-Mex. It can rebound with the blare of mariachi trumpeters and is often bedecked with balloons celebrating a quiceañera---all part of its raffish charm. Plunge into the party with an order of chicken and bean nachos with guacamole and the namesake pico de gallo just to whet the whistle. Then contemplate sharing a parrillada platter that groans under the weight. Consisting of charbroiled and baked ribs, chicken, fajitas, stuffed chilies and much more, this is a feast fit for the record books. Lesser appetites might appreciate the baked kid goat with frijoles a la charra or the flautas de camaron with the inevitable Spanish rice and refried beans. Among the enchiladas, we admit to preferring the verde version with chicken and a tart tomatillo sauce.